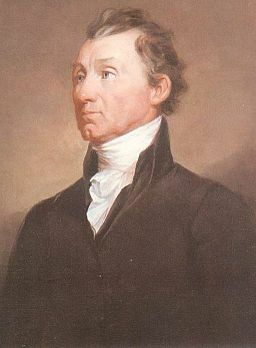 James Monroe was the son of a Virginia plantation owner. He became an orphan in his mid-teens. Fortunately, he stayed with his uncle who liked James and his siblings. In 1774 Monroe attended William and Mary College in Williamsburg. Monroe and his friends found plenty to do outside the classroom. The Royal Governor had already left town due to the spirit of rebellion among some Virginians in the colony’s capital. Along with a few classmates, Monroe helped to raid the absent governor’s palace. The young men took 200 muskets and 300 swords which they gave to the Virginia militia. In the winter of 1776, Monroe joined the Virginia infantry. By the time he became president, Monroe’s resume included service as a soldier in the Revolutionary War, U.S. senator, minister to France and England under President Washington, governor of Virginia, and positions as secretary of state and secretary of war under President Madison. He became friends with James Madison and Thomas Jefferson while the U.S. government was being formed. Together, the three of them opposed the policies of John Adams and other Federalists. Though he often receives less attention from scholars than other presidents who came from Virginia, Monroe’s elections and administration were notable for several reasons. In the 1820 election Monroe got all the electoral votes except one. When elected, Monroe was the first president to hold his inauguration outdoors. He was also the first chief executive since Washington to take a national tour of the country. Unlike his friends Jefferson and Madison, Monroe had an outgoing personality that endeared him to the other Americans he met. His cross-country tour was such a success that he travelled several times while in office. As president, Monroe utilized his agreeable personality to great effect. He had a talent for picking men with great minds to serve in his administration and maintained good relationships with his cabinet members. Despite his opposition to John Adams’ political views, Monroe chose Adams’ son, John Quincy Adams as secretary of state. Monroe’s easy going personality allowed him to get along with almost anyone, so the two men established a good working relationship. Adams encouraged Monroe to make a statement about European influence in the Western Hemisphere. In his annual message to Congress, Monroe stated “the American continents, by the free and independent condition which they have assumed and maintain, are henceforth not to be considered as subjects for future colonization by any European powers.” This part of Monroe’s message came to be known as the Monroe Doctrine. The doctrine made it clear that America had a right to protect any nation in the Western Hemisphere against European aggression. As a product of both John Quincy Adams and Monroe’s ideals, the doctrine aptly demonstrated the president’s ability to partner with unlikely people for the good of the country.